Tekshi 6ix9ine is serious gathering a long history for his career. His outstanding case will never get burnt yet the rapper keep making inflammable felony and this time he is about to face awful decade. Previously he was pleaded guilty just last week following his mountain of Criminal charges figured out in between his gang Nine Trey Bloods gang. 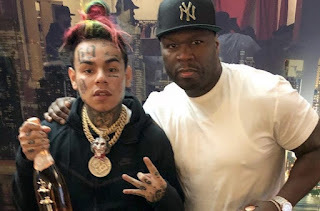 Talking about Snitching, obviously 50 Cent is not the only peer in hip-hop who has made a verbally expression over Tekashi 6ix9ine of course Snoop Dogg once made his advocate on FEFE raper. The popular 6IX9INE is indeed cooperating with his persecution. He has confesses over Chief and since all this while the rapper has been getting nasty off his chest, detailing the fact what actually happened with his gang member Chief. His foes twitter gave him a nick name Snitch9ine which is becoming a trademark. We all knew him and his trolling, but he has been on low key to open up. Who are we talking about, just 50 Cent. The G-Unit rapper has made appearance online on what is making the rounds online. Though it been very rare for him to hit his jab on his son in hip-hop yet he did. 50 Cent took to his millions followers and poke fun on 69 even bringing in the detained 21 Savage. On his post on Instagram- although the rapper later get ride over but fans managed to get the screen shot before 50 Cent delete the post. "[Tekashi]: 'I ain't a snitch.' Judge: 'You are looking at 47 years of hard time.' [Tekashi]: 'You guys ever noticed 21 Savage looks British?'" 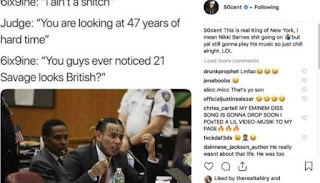 50 Cent also post a vicious about 21 Savage over been an UK informant. The 21 who gave us a new video A lot was apprehended by the US Immigrations and Customs Enforcement (ICE) on February 3. US alleged him of being a British unlawful in U.S even 21 Savage birth certificate has been leaked. While still worry the Power Man, he also bring it in on his post intagram post.